Consuming soy products and soy milk for their health benefits is surrounded by controversy. Many vegans and vegetarians rely on soy because it is a good source of complete protein, amino acids, vitamins, and minerals. However, many people say that consuming more soy is linked to dangers such as cancer, hormonal imbalance, and thyroid disorders. Are soy foods and soy milk good or bad for you? Does consuming soy pose any health risks for men or women? Scientific research into the health benefits and risks of soy comes up with conflicting answers. 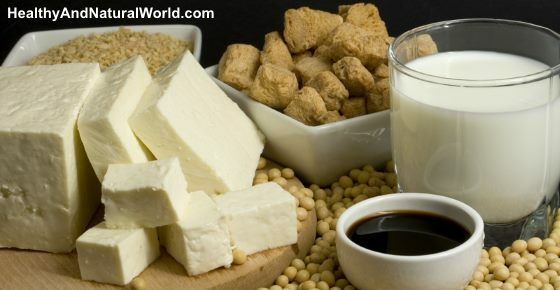 In this article, you will find out what science really says about whether soy milk, soybeans, and soybean-based foods are good for you. Soybeans are a type of legume (or, pea) that grow in many countries around the world. The largest producers of soybeans in the world are the United States and Brazil. Soy-based foods come in many shapes and forms. Vegans consume soy milk as an alternative to dairy products. You can also buy tofu, soy flour, soybean infant formula, and soy as a meat substitute. Fermented soy products such as miso, tempeh, and natto are popular dishes in Asia. You can also eat cooked immature soybeans which are called edamame. The rich nutritional value of soybeans means that soy foods and beverages might be a healthy alternative for people who choose a meat and dairy-free diet. 100 g of cooked soybeans also contains 5 g of iron (29% RDI), 86 mg of magnesium (21% RDI), 102 mg calcium (10% RDI), and 0.8 mg of manganese (41% RDI). Soybeans also contain large amounts of vitamin K, vitamin C, and B-group vitamins, as well as trace amounts of vitamins A and E.
So, if soy seems so good for your health, what is all the controversy about? Much of the discussion on whether soy is beneficial for your health or detrimental to it is connected to the large amounts of isoflavones in soybeans. However, other studies show that soy isoflavones can have a beneficial effect on your health. At the end of this article, you can find more information on what science says about the link between soy and cancer. Obviously, more research into the health benefits/risks of soybeans and soy food products needs to be done before you can definitely say if soy is good or bad for you. Soy milk is one of the most popular alternatives to dairy milk for vegans or people who are lactose intolerant. Soy milk looks like dairy milk and has a natural savory taste like beans. Most commercial soy milk products are flavored to improve the taste (for example, vanilla soy milk). There are many benefits of drinking soy milk because it is a rich source of minerals, vitamins, and essential amino acids. Some manufacturers also fortify their soy milk drinks to increase the calcium content to that of dairy milk. One glass of unfortified soy milk contains 10.3 g of crabs and 55.1 mg calcium which is 6% of your recommended daily calcium intake (RDI). Soy milk is also a good source of minerals like manganese, copper, magnesium, iron, and potassium. Soy milk also contains B-group vitamins as well as vitamins C, E, and K.
Let’s look in more detail at the benefits to your health of drinking soy milk. Soy milk is an important plant-based source of proteins and is classed as a source of complete protein. One glass of soy milk contains approximately 6.4 grams of protein which is 13% of your daily protein needs. Soy milk contains amino acids such as lysine, tryptophan, threonine, phenylalanine, and leucine. These are only obtained through diet and are essential to your body’s metabolic processes. Drinking soy milk is a healthy alternative to dairy milk if your gastrointestinal system has problems digesting lactose. Some people are allergic to soy and soy-based drinks and therefore lactose-free soy milk isn’t a suitable dairy-alternative for everyone. Because soy milk contains no animal-derived ingredients, it is perfect for vegans and others who want to stay away from meat products. Drinking protein-rich soy milk is a good way to strengthen your body and get your essential amino acids. Some types of soy milk also have added calcium, vitamin A, and vitamin D.
One of the benefits of choosing soy milk over dairy milk is that it is cholesterol free. Drinking soy milk can also reduce your total cholesterol, low-density lipoproteins (LDLs), and triglycerides. Find out what else you can do to manage high cholesterol without having to use medication. Consuming soy-based products and soy milk can be good for you if you suffer from diabetes. Learn about other foods to control type 2 diabetes. The effects of soy estrogen could mean that drinking soy milk or consuming soy foods can help to manage symptoms of the menopause. Scientific research has found that one of the soy isoflavones benefits is increasing estrogen levels in postmenopausal women. Learn about the best supplements you can take to relieve many symptoms of the menopause. Is Soy Milk Bad for You? If there are so many science-based research studies on the benefits of soy, why do so many people say that soy or soy milk is bad for you? If you regularly drink soy milk, you should make sure and take omega-3 supplements to lower the fatty acid ratio. What are some of the other reasons why soy milk could be bad for you? One of the concerns that many people have with adding more soy milk to their diet is the fact that many soybeans are genetically modified. If you consume soy milk, always choose a non-GMO 100% organic soy milk or soy milk powder. The high levels of isoflavones in soybeans are one of the reasons why people say that soy or soy milk is dangerous for health. Researchers point to the fact that phytoestrogens are powerful enough to be used as hormone replacement therapy, and at the same time soy-based infant food is commonly used for pediatric nutrition. Some scientists are also concerned about the large quantities of soy used for animal fodder and that the estrogen hormones in soy get into the food chain. Learn how to spot signs that you have a hormonal imbalance in your body. One of the reasons why some researchers say that soy milk is bad for men is that its estrogen-like phytoestrogens can affect male reproductive health. Soy milk may be bad for your thyroid health because soybean products can inhibit production of the thyroid hormone. Further reading: your complete guide to thyroid hormones. There is also increasing concern about soy formula that is used as a replacement for breast milk. The concern revolves around phytoestrogens that act like the hormone estrogen in the body. Does Soy Increase Risk of Cancer (Such as Breast Cancer)? One of the most controversial questions when it comes to consuming soy products is if soy causes breast cancer. Many people say that consuming fermented soy products is much healthier for you that non-fermented soy. How Often Can You Eat Soy and How Much? After learning about the benefits of soy, soy milk, and fermented soy products, you might decide to increase the amount of soy in your diet. Or, you may feel that the potential risks of increasing soy-based food outweigh the possible health benefits. Soy…NO!! The phytoestrogens in soy have a very unique property…….they actually rob the hormone receptor site on the cell. This sealing of the receptor site renders you own secreted hormones as useless since they can no longer get into the cell to their work. Consider the number of hormones your endocrine system produces and the myriad of body functions that are they enable. Doesn’t take much to figure out that those soy phytoestrogens will, over time, cause many dis-eases. Please note that this property of soy phytoestrogens cannot be removed from the soy mush so you are getting this anytime you consume any soy, be it organic or non-GMO. Soy is NOT fit for human consumption! For that matter, I do not give it to my pets either! A small quantity once in a while is fine for most people. The problem is that a lot of people munch on edamame like it’s popcorn, consuming it in large quantities and frequently. In this case the quantities of phytoestrogens, phytic acid and goitogens in the edamame add up quickly and these are not good for you. interesting reading. I personally need oestrogen so it’s a great way of supplementing my body’s oestrogen levels. I think you’ll find that just about every wheat product, cake, biscuit and loaf of bread is made from gmo wheat these days and if Monsanto get their way, everything will be gmo … theirs! humans are the only creature that drink milk as adults, let alone another creature’s milk, and that and the meat industry is disgustingly full of antibiotics and gmo breeding.